This beach is a near-perfect horseshoe. It is located in a small bay. Its size is 660 metres long by 25 metres wide. It is very densly occupied (only 5.1 metres per person). 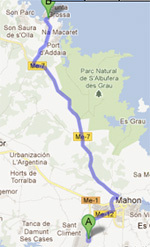 Take the northern road from Maó to Fornells (Me7). After approximately 20 kilometers you will get to the junction that leads to S'Arenal d‘en Castell. A taxi should cost you between 25 and 35 euros, depending on the number of suitcases, the time of day or night of your journey and the number of passengers carried. During the summer months, a very limited bus service runs from S‘Arenal d‘en Castell. There is a flat headland at the eastern end called Punta Grossa which links to the wooden end of the beach with its sand dunes.